If you’ve been to Koya, you’ll know exactly where the inspiration for this dish came from. The end result is nothing like the delicate, tasty and – above all – neat version you’ll find at this delightful Japanese udon specialist. But the key ingredients are there. I can’t believe I haven’t come across this particular combination more often. Apples, after all, are a natural partner to pork, their tart fluffy flesh an ideal match for fatty rich flesh. And their acidity matches salty umami-rich soy blow for blow too. This a gentle assault on the senses, a slow motion hammer-thwack of a dish. The pork belly is so meaty and rich, the uber-tender flesh sandwiched like geological layers with thick unctuous, creamy white fat. What ho Stanley, it’s time to go digging! Digging right down till we hit the pork. The transformation from a solid meaty lump of prime pig into a meltingly soft, smooth thing of beauty, has never ceased to amaze me. It’s like turning water into wine or some other culinary miracle. And what a miracle it is. The pork absorbs all the flavours, and becomes all wibbly wobbly. Like an overbearing parent it smothers you in a thick duvet of flavourful love. Gentle appley tastes and spicey undercurrents bourne along on a lava like layer of salt, sweet, savoury and uber-umami. And then there’s the fat… Oh the fat! I can only ever manage a cube or two, but for afficiandoes of the artery clogging stuff, this is the real deal. A soft quicksand of overwhelmingly rich gummy joy. But the best thing? The best thing is that you can throw all this together, put it on the hob and then forget about it as the house fills with mouth watering, rumble-inducing aromas of slowly transforming pork. Eau de meat, the wonderful water of life. 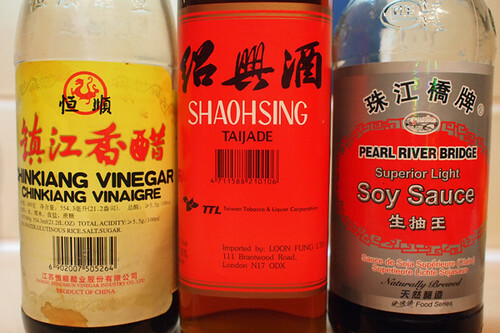 This dish is very flexible, you don’t have to use pork stock, you could use chicken stock, water or even dashi stock (in which case substitute Japanese soy, sake and rice vinegar for the Chinese variations listed below) instead. You could also go Italian and use balsamic, wine and fragrant herbs. 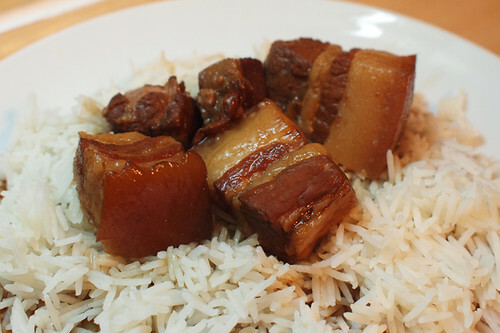 There are endless variations on the theme of unctuous cubes of creamy pork fat and delicately tender meat. Cut the pork into large rectangles about an inch square or so. Mine are always very approximate. Put into a pan wide enough to hold them all on a single layer. Put the pan over a medium heat and pour in all the liquid ingredients. Add the star anise, chilli, ginger and sugar and stir until the sugar is dissolved. Slice three of the spring onions into finger lengths and chuck them in. 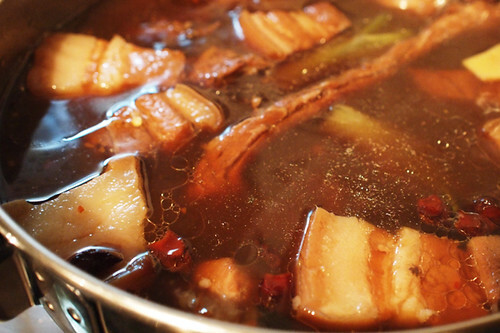 Bring everything to a slow simmer, then turn the heat down as low as you can, cover and leave bubbling away for a couple of hours, turning the pork occasionally. Now remove the meat and set aside, pour the liquid through a seive into a jug and then pour it back into the pan (minus all the solids) and bring to a lively simmer. Reduce to desired consistency. 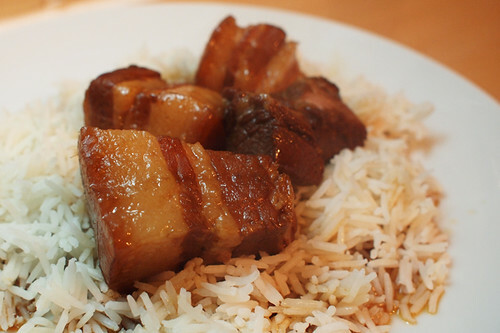 Reheat the pork in the sauce and serve over rice or noodles, garnished with the last spring onion, finely shredded. Pork belly – just one of my faves in all its many guises. As is star anise, you can’t go wrong with star anise! Not that I should be giving you any kitchen tips, but you could give this dish even more of a more Chinese feel by using rock sugar instead of demerara. Rock sugar is widely available at most Chinese supermarkets. How I love me some pork belleh Asian style ^_^ I think it’s because the ginger takes the overly meaty stench away, looks toppo Aaron. Can’t beat a bit of braised pork belly, I think I’ve reached a point where I prefer the rind and fat boiled over roasted. As such I think 500gr of pork belly is 1-2 people. I think some cassia would do wonders too, apples do love a bit of cinnamon. That looks really nice, need to get me a slow cooker and I’ll show you some of my favourite slow cooked stuff as well. If you this kind of thing you’ll love some of the other dishes I’ve got in the recipe bank! @Mr Noodles – Yes! On both counts. I will keep my eye out for the rock sugar – is it similar to jagaree? Which i can get in my local Londis. @Joshua – Yep – I agree to that. I still can’t manage more than a cube or two of the fat, it’s so rich. More practice needed methinks… And yes, you are right about the cassia, i will chuck it in next time round. The world is conspiring to make me eat pork belly. This is the third recipe TODAY to make me drool over the stuff (not a bad thing). 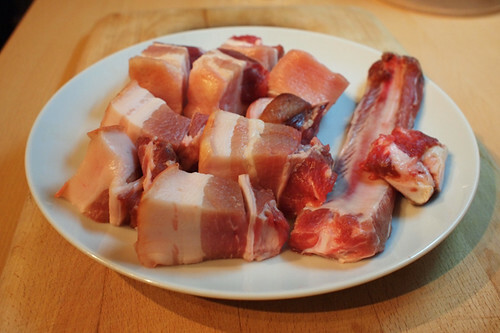 I heart pork belly, and this looks like a beautiful recipe. @Mr Noodles – I was mis-spelling it which probably didn’t help, it’s actually Jaggery and here’s the link: http://en.wikipedia.org/wiki/Jaggery. But it isn’t rock sugar, it’s a concentrated mass taken from cane sugar juice, a mix of crystals and molasses. I suspect it would give a different taste. I will keep my eyes peeled for the rock sugar next time I make this. @Becci – three different people pushing pork bellies? The world is definitely trying to tempt you… and rightly so! You can get rock sugar in Dalston’s Chinese shop. Pork belleh! Get in my belly! @Joshua – that is good to know, next time i’m there I’ll pick up some. Looks delicious. I can almost smell it! @Leluu – coconut juice sounds like a great thing to braise the belly in, another nutty, fruity liquid to infuse the meat. @Leluu – recipes are there to be broken (or something…) I don;t think i ever follow a recipe fully, the fun bit is adapting, changing and seeing what the effect is. I really like the idea of the coconut and fish sauce addition. That added sweet creaminess and pungency must have been wonderful!